GREENCOAL technology is the only technology in the world that can convert domestic solid waste into a renewable energy source. 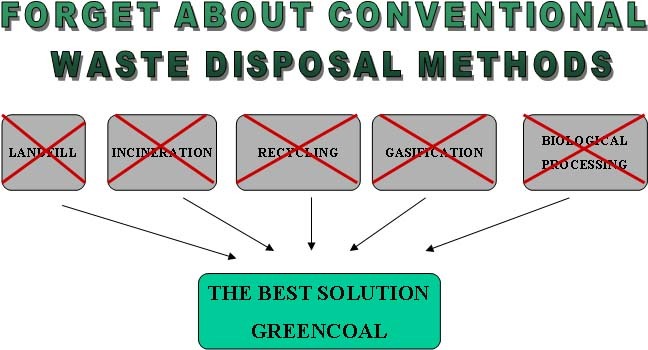 The GREENCOAL Project is a reliable alternative to selective waste sorting, especially in the areas where this process is very slow or even not yet implemented, being a sustainable alternative to land fields and waste dumping, incineration, biogas production and degasification. GREENCOAL technology is the only technology in the world that can produce caloric pellets that can be fired in conventional power plant. The GREENCOAL pellets are brittle and they can be easily crushed (with less energy than for the fossil coal). •The pre-sorting of waste will be avoided. •All the technology used in the process it is already developed and tested all over the world. •All the recuperated products can be reused.